Overall Design: The Crahoppers Deluge jacket is constructed using Craghoppers Aquadry. Fabric consists of Polyester with PU coating (Aquadry) outer layer and an inner layer with an upper part in a polyester mesh and a lower part in soft polyanamide fabric. The materials in the hood have a similar part mesh, part soft fabric liner. 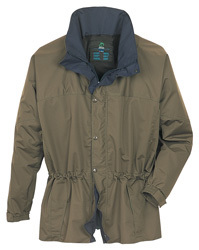 The jacket was tested in generally mild, showery and windy conditions at higher elevations in the Yorkshire Dales and in the Northern Pennines in late winter. The jacket performed well as a windproof shell, (wind-chill on one occasion was zero degrees Celsius) was waterproof (rain drops were seen to form droplets on the fabric surface in both showers and heavy rain) and was breathable, at lower levels. A map in the map pocket stayed dry. It was warm and had to be removed at low levels, (although the tester was wearing a buffalo jacket underneath at the time, so this may not be entirely fair!). Overall Design: The jacket has a front zipped opening with storm flaps and 'poppers'. It is adjustable at waist and hem and hood via shock-cords and temperature control is easy. The jacket has two external zipped pockets, a zipped map pocket and a small zipped concealed pocket. The stiffened hood folds away. Overall it has a smarter appearance than many waterproof jackets, especially with the hood tucked away, and which it retains when the pockets are �loaded�. The jacket would perform well in all but the very worst winter conditions. Fit: Tester: male, 5' 6'', average build Good length in the body and sleeves. Extensive adjustments can be made, without removing the backpack. Zips: The main zip goes all the way down the front and is easy to use with gloved hands. Storm flaps are good and poppers close out the worst of the wet. The two external pocket zips are more difficult to use, and are slightly awkward to get at. The zips on these pockets occasionally foul the lining. Map pocket and the concealed pocket zips are easy to use. There are internal zips to allow the fitting of a fleece jacket. Pockets: External pockets are a little small for my taste. Zips need to be fastened to be absolutely sure of the security of the contents. The map pocket is good and is accessible without undoing the front opening zip. The small concealed pocket is useful. Both internal pockets have additional linings. Hood: The Hood has a wired front, is adjustable by shock cords and with a volume adjuster at the back. Adjustment is easy in poor conditions. The hood folds away into a pocket fastened by Velcro and is easy to extract and to return to its pocket, without removing the jacket. The hood doesn�t flap around and stays in position in high winds and will go over a hat. The face-guard is adequate for poor conditions. Cuffs and Collar: The cuffs are adjustable via Velcro fastenings. The collar isn�t adjustable but fitted snugly and prevented any �bellows� effect. Care and Maintenance: The usual care symbols listed on a label inside the jacket. The tested jacket was slate grey and shows dirt easily. It would need washing more often than the tester is used to doing, but this could well be an advantage since this will protect the waterproofing. Technical performance of the Craghoppeers Deluge - breathability, waterproofness , windproofness is good. More adjustment available than any reasonable walker could possibly want. Very smart appearance - especially with the hood stowed away. This gives it additional wearability. Additional concealed pocket. Good jacket for most conditions met in British hills. Not too keen on the two small external pockets - awkward access, tricky zips. The colour (slate grey) shows the dirt easily.